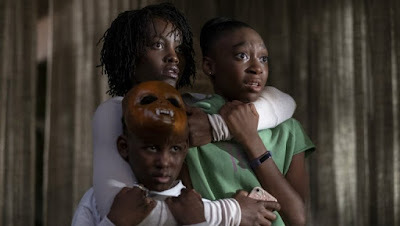 The anticipation for Jordan Peele's sophomore effort, Us, was greater than anything I've ever seen for a director's followup to a horror movie. But that was the cultural impact of 2017's Get Out that Peele has so quickly become a director whose films are appointment viewing. Us had a record-breaking debut over the weekend with a massive $70.25M, more than double Get Out's $33M launch. It's biggest premiere weekend ever for an original horror movie. That's also more than triple the film's meager $20M budget, and the second-largest debut ever for an original live-action movie. It's also further evidence that movies featuring mostly black casts can be tremendously successful, following on the trend started by Black Panther. Peele is out here creating movies audiences have never seen before, and it's the kind of thing we always say we want more of yet fail to support. But Peele has tapped into something and it's safe to say all eyes will be on what he does next. Captain Marvel continues to soar, adding another $35M to give it $321M domestic. Worldwide the $1B mark looks like a certainty, with $910M earned in only three weeks! Expanding into just over 650 theaters is the Julianne Moore-fronted drama Gloria Bell, with $1.8M. The film is a remake of the acclaimed 2013 film, written and directed by the same filmmaker, Sebastian Lelio. Moore plays a middle-aged divorcee who is adventurous in getting her love life back on track. It's a good movie and targets an audience that is rarely catered to these days. I'll be curious to see if it expands further.